Q: How do you promote innovation? A: You listen. To everyone. At the recent “Great Place to Work For All” summit, an annual event sponsored by Great Place to Work (GPTW), the focus was on inclusion. Speaker after speaker drew a direct connection between everyone at the organization feeling heard, and business innovation. 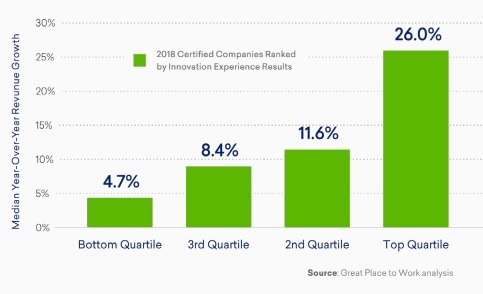 Note that “innovation” in this context does not necessarily refer to jet packs and talking appliances (although a presentation by Uber Air was pretty mind-blowing). It means anything from everyday small improvements to massive upsets in the way products are made, services are delivered, things are done — in even the most traditional industries. True innovation of this sort, said the many proselytizers at this event, does not arise solely from your R&D group, or from a task force, or even a hackathon. It is about providing people in positions all over the company with the feeling that their ideas matter, and then listening to them. Researchers found a direct correlation between employees (especially on the front lines) feeling they had real opportunities to contribute their ideas and a company’s business success.One of the questions on the GPTW engagement survey is, “Over the last year, how many meaningful opportunities have you had to develop new and better ways of doing things at work?” The response to this single question turns out to be the number one predictor of companies that have had the greatest revenue growth; those in the top quartile of positive responses experience 5.5 times higher median year-over-year revenue growth than those in the lowest quartile. “Friction” companies, where innovation is in short supply, had a ratio of 3:2. In innovative organizations, an overall experience of authenticity — in relationships and embedded into practices — is at the heart of the employee experience. This, in turn, allows people to operate in an environment of trust, where they can contribute their innate creativity and intelligence. In one of the best and most inspiring presentations, Frans Johansson, founder & CEO of The Medici Group, expounded on his theory that true innovation occurs at the intersection of vastly different perspectives — the more different, the better. As a result, diverse teams are not just nice-to-have, they are essential. In fact, explained Johansson, the power of diversity is so strong that it challenges traditional notions of expertise and experience. If you’re choosing between two people to add to your team, and one has a bit more expertise while the other brings diversity, the best business decision may well be to choose the diverse candidate — the perspective she brings to the team will trump her competitor’s slight edge on expertise. Taking this example a bit further, however, Johansson pointed out that one diverse individual — especially one who is new to the team — might feel too much pressure to assimilate, hiding the unique perspective which makes them so valuable. The answer, of course, is adding more diverse team members — even if they are not diverse in the same way. To make use of employees’ ideas across the organization, you first have to hear them. (And, since employees who feel listened to are more likely to contribute their ideas, asking for their input promotes a virtuous cycle.) Several speakers promoted the idea of near-constant, real-time feedback systems. At the tech company Workday (#4 on the Fortune “Best Companies to Work For” list), every week ends with Feedback Friday: the company asks employees two questions taken from the Great Place to Work engagement survey. After 17 weeks, all the questions have been asked, and they start all over again. Workday, which estimates it takes employees 15 seconds to complete the weekly survey, says the results garner them half a million data points. They can then cut the data by office location, gender, generation, function, seniority — you name it. And because questions repeat every 17 weeks, they can do other things with the data, as well. 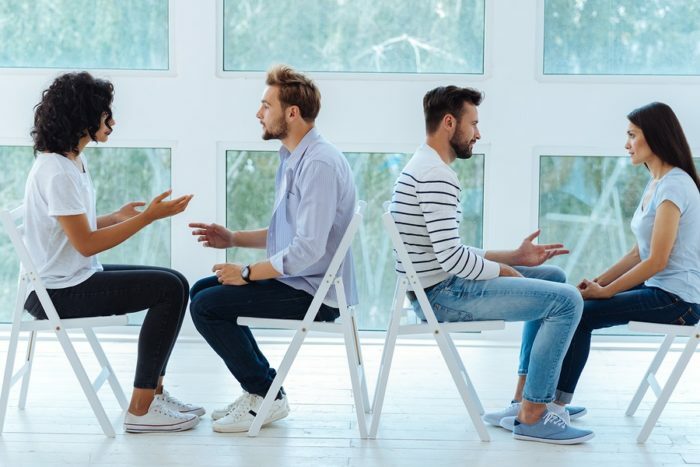 When the company introduced a new course on people management, for example, it was able to compare results from employees whose supervisors had taken the course to those whose supervisors hadn’t, for an instant read on the course’s value. As another quick example, at Hilton (#1 on the Best Companies list), hotel managers conduct regular focus groups, seven employees at a time, listening to and addressing their concerns before moving on to the next group of seven. Of course, creating a truly diverse environment, and then making it inclusive by listening, may take some work. If your culture is not there yet, changing it is not going to be easy. But I can’t help marveling at the simplicity of this as an answer: It doesn’t take fancy programs and policies and perks to create a productive, innovative work environment: it just takes respecting and valuing your employees by hearing them out.